This is book 5 of the Peter Grant series. I have so been enjoying the Peter Grant series, and strongly recommend them to anyone who enjoys the Dresden Files or the Alex Verus series. A different flavor of the modern-day wizard, urban fantasy story, and one that seems, if one can suspend disbelief, reasonable in terms of "We don't know" and "Let's find out" of magic. That anyone can learn is a premise of the story-line, which I can appreciate. 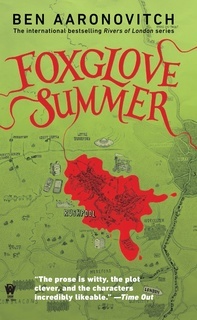 The book centers around the disappearance of two girls in a small English town (village, hamlet, something...). Initially unsure if there's anything "weird" about their disappearances, that there is a WW2 era practitioner living nearby lends reason to investigate, and Peter does. The book deals with some of Peter's life frustrations. He's been holding things together, despite some ugh awful things happening. We learn more of Peter's history, more of his family dynamics. The book was a fast read. There are two more currently published book and one novella in the series. Will definitely keep reading them. Once Mr. Punch and the M25 were behind me, I tuned the car radio to Five Live, which was doing its best to build a twenty-four-hour news cycle out of about half an hour of news. This cracked me up. Yes about how frustrating news cycles are in order to obtain and keep attention. Never underestimate the ability of a police driver to misjudge a corner when finally coming home from a twelve-hour shift. Missing kids are tough cases. I mean, murder is bad but at least the worst has already happened to the victim—they’re not going to get any deader. Missing kids come with a literal deadline, made worse by the fact that you don’t get to learn the timing until it’s too late. “Do you think I’m going to get my daughter back?” she asked. Because you’ve got to have hope and no news is good news. And because the best you can do is sound like you’re being forthright and sincere. If they get their kids back they won’t even remember what you said and if they don’t—then nothing else will be important. “That’s a bit presumptuous, isn’t it?” I said. “Presumptuous is my middle name,” said Dominic. He called it potentia because there’s nothing quite like Latin for disguising the fact that you’re making it up as you go along. Polidori’s theories were as good as anyone else’s. But sticking a Latin tag on a theory doesn’t make it true. Not true in a way that matters. Absence of evidence, as any good archeologist will tell you, is not the same as evidence of absence. A lot of men must have left their belongings behind in 1944 believing that they were coming back. We all do this. We assume we have more life. Not always a good assumption. All your cases, I thought, do not belong to us. This cracked me up. I love the cultural references in these books, even if I do have to look up most of the English ones. Right, I thought. If you can’t be clever then at least you can be thorough. And everyone can do the work. During the whole pointless process not one resident refused to let us in or objected to us looking around, which I found creepy because there’s always one. But Dominic said no. “Not in the countryside,” he said. I wanted to ask where Beverley was, and how the Teme family just happened to have her phone. But if there’s one thing Nightingale has taught me, it’s to let other people talk themselves out before giving anything away. We were pretty certain we knew roughly where he’d been, but members of the public have an unnerving tendency to switch straight from lying to your face to telling you what they think you want to hear—with no intervening period of veracity at all. That’s fine when you’re looking for them to put their hand up to some crimes and boost your clear-up statistics. But when the lives of two kids depends on the accuracy of the statement, you tend to be a bit more thorough. He told us the truth, although it took ages to pry all the sordid details out. Which just goes to show that if you want a confession, use a telephone book—but if you want the truth, you’ve got to put in the hours. Nightingale says that conspiracies of silence are the only kind of conspiracies that stand the test of time. I woke in the hour before dawn, stuck in that strange state where the memory of your dreams is still powerful enough to motivate your actions. Wow, yes. Those moments are powerful. Because it’s always a waste of time, all those rushed, angry stupid things you do. They never solve the problems. Because in real life that rush of adrenaline and rage just makes you dumb and seeing red just leads you up the steps to court for something aggravated—assault, battery, stupidity. “Imposing themselves on the landscape”—they’d always called it that on Time Team. Especially the beardy Iron and Bronze Age specialists—“ The Romans imposed themselves on the landscape.” Or, I thought, they wanted to get from point A to point B as quickly as possible. “That’s my line,” I said, and Beverley shrugged. “Sic transit Gloria mundi,” I said, because it was the first thing that came into my head—we clinked and drank. It could have been worse. I could have said “Valar Morghulis” instead. "Thus passes the glory of the world," in Latin, and "All men must die," in High Valyrian. I didn’t tell her that I was pretty much legally required to have an adult present—it’s easier to manage people if they maintain a sense of agency. I had one of those “somebody do something” moments when you suddenly have the realization that the person supposed to be doing something is you. When faced with a low-level hostage situation your first task is to calm the hostage taker down long enough to find out what they want. Then you can lie to them convincingly until you negotiate the hostage back, or are in a position to dog pile the perpetrator. You swear an oath when you become a police officer—you promise to serve the Queen in the office of constable with fairness, integrity and impartiality, and that you will cause the peace to be kept and preserved and prevent all offenses against people and property. The very next day you start making the first of the many minor and messy compromises required to get the Job done. But sooner or later the Job walks up to you, pins you against the wall, looks you in the eye and asks you how far you’re willing to go to prevent all offenses. Asks just what did your oath, your attestation, really mean to you? But sometimes the right thing to do is the right thing to do, especially when a child is involved.